My Two New Chapbooks are Here! I am happy to announce that I have two new chapbooks available from Everdale Publishing through lulu.com. The first is a compilation of my December poems for the seasons of Advent, Christmas and the winter solstice, Festival of Lessons and Carols. A perfect gift for friends and family. Or for when you have those quiet moments to reflect on this wonderful time of year. The second book is Penelope to Her Husband, Poems of Myth and Fantasy, a retelling of myths, faerie tales, fables, with old and new characters that I hope will charm you. 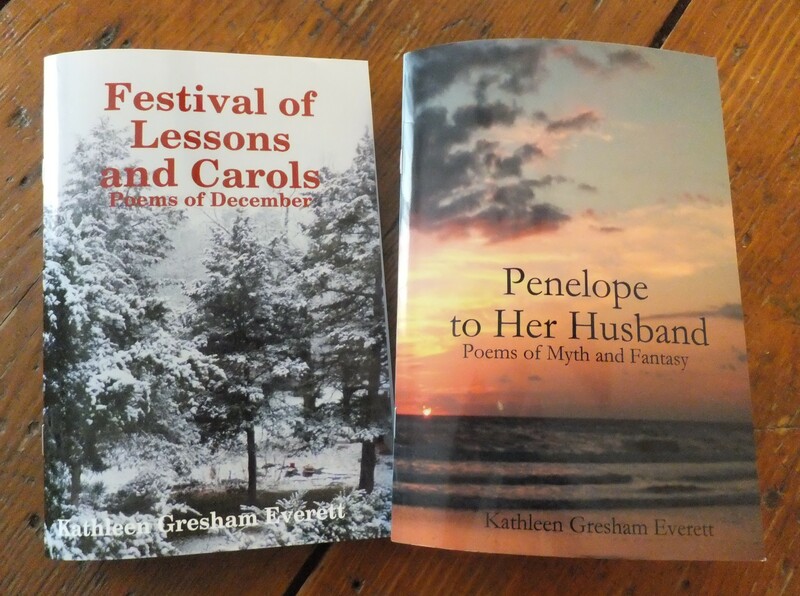 This entry was posted in Ozarks, Poems and tagged Christmas, Festival of Lessons and Carols, gifts, new chapbooks, new poetry books, Penelope to Her Husband, poems of fantasy and myth, poetry books for Christmas by The Course of Our Seasons. Bookmark the permalink. Wonderful news, Kathleen, and just in time for the holidays! Hi Linda – thanks – isn’t it always wonderful to see one’s work out in the world. A chapbook is a small volume of poetry – usually around 20 poems, sometimes with an over-all theme. Not sure why they are called chapbooks – I know that chapbooks were once cheap mimeographed, sometimes very home-made, books. Thank you. Thank you. Thank you. For our candy cash and spooky card! We❤️U!!! WOW! You are Getting Stuff Done! This is thrilling news and I am happy lulu worked out for you – they’re great. These both look completely enticing. Wonderful accomplishment, my friend. You inspire me. I will get moving! So excited to see this! Emailing you now with my official order for both chapbooks. 🙂 Congrats, my dear! !